ES&S To Face Tough Questions From County Elections Board, Others States Need to be Notified of the Problems! This article was posted at The Brad Blog. It is reposted with permission. Summit County has recently had problems with failed memory cards as related by The BRAD BLOG on March 9 and March 10. As reported at the time, as many as 30% of the cards completely failed initial testing in the county. A few days later, corresponding tests in North Carolina found more than 1000 of the cards failed. The memory cards, amongst other things, store the vote tabulations from elections. New tests now in Summit County have also revealed additional failures on both memory cards, and the voting machines "firmware" as well. Today the Akron Beacon Journal has revealed that Summit County has discovered 28 more bad cards in a batch of what was supposed to be good cards as sent to them by ES&S specifically to replace the previous bad ones. The elections drama that unfolded this week in Jefferson County, TX is an example of what can happen when an extraordinary amount of power is placed in the hands of a few. Democratic and Republican primary elections were being ‘held hostage’ by iVotronic manufacturer ES&S. Jefferson county purchased iVotronic machines in order to comply with federal law by the first primary election of the year. On March 7, the iVotronics were in place, but the system was not. Database components were missing. The programming was flawed. There were equipment failures. County Clerk Carolyn Guidry stated tabulation errors led to votes being counted twice. She added that the ES&S personnel were ill-informed. The Jefferson County Commissioner’s Court reviewed what happened on March 7 and concluded that ES&S was not fulfilling its contractual obligations. They decided to withhold payment until ES&S held up their end of the bargain. This is a standard practice; when homeowners or businesses hire a contractor, they do not pay the entire sum in advance but pay a portion when work begins. The remainder is paid when work is satisfactorily completed. Even though the March 7th election was problematic and far from satisfactory, ES&S demanded payment. The company stated that they would not provide programming and technical support for the run-off election until they were paid $1.95 million. County officials knew they could not conduct the run-off election on iVotronics unless they had ES&S support. Assistant District Attorney Tom Rugg told the Beaumont Enterprise, “They are refusing to do things only they can do. Without ES&S programming, "the system they say they've sold to us is essentially worthless." Unable to put the voting machines to use, the County planned to use paper ballots for early voting, which begins Monday. “We’re cutting and pasting from sample ballots,” stated Chief Deputy County Clerk Theresa Goodness. County officials expressed concern about accessibility, but said if they did not reach an agreement with ES&S they would have to use paper ballots. The Secretary of State’s office reminded Jefferson county officials that they risked losing federal money and sanctions from the Justice Department if they did not meet handicapped-accessibility requirements. This article was published on The Brad Blog. It is reposted here with permission of the author. Meanwhile...in Pennsylvania's Allegheny County, where plans to use Diebold's hackable Electronic Voting Equipment have recently been nixed, Plan B seems to be failing too. The machines they'd hope to use instead, as made by Sequoia Voting Systems, have now been shown to be hackable as well. Pittsburgh's Post-Gazette picked up on the story yesterday, and followed up today on the testing being run in Allegheny County by Dr. Michael Shamos, a Carnegie Mellon University professor, on the "new" Sequoia Voting Machines. The county had hoped to use these systems -- ten-year old Sequoia "Advantage" machines as purchased from Clark County, Nevada who is moving to a different Sequoia system -- in their upcoming Primary Elections in May. That plan, now may be in grave doubt. The testing of the machines has found so many problems -- including Shamos' findings during "tampering tests" that he was able to instantly "transform a handful of votes into thousands" -- that he has now simply shut down the entire process described as "pointless" due to all of the errors in the software. Last December, California Secretary of State Bruce McPherson asked an advisory board of computer scientists to conduct a security review of the memory card components for both Diebold's AccuVote-OS (optical scan) and AccuVote-TSx (touchscreen with voter verified paper audit printer) voting systems. The report, “Security Analysis of the Diebold AccuBasic Interpreter”, which was released by the California's Voting System Technical Assessment and Advisory Board (VSTAAB) in February, confirmed numerous security vulnerabilities in Diebold’s electronic voting systems. The original goal of the VVSTAB scientists was to verify the results of an earlier test of voting system security that was performed in Leon County, Florida. The Leon County test, conducted by Finnish computer programmer Harri Hursti, definitively proved that election results can be altered on a Diebold voting system, without detection, by using a single memory card. The computer scientists, who conducted only a limited review of the Diebold source code, not only confirmed the validity of the “Hursti Hack” - they also discovered 16 other serious security “bugs,” each of which could be exploited to alter election results without detection. And the report cautions that “these are just the bugs we were able to find; there are quite possibly others we did not notice…” Elsewhere in the report they reiterate, “There may, of course, be additional bugs, or [different] kinds of bugs, that we did not find.” The report also confirms that the Diebold TSx (touch-screen) has many of the same vulnerabilities as the optical scan system that was tested in Leon County. Since there are valid security reasons why interpreted code is not allowed under the current standards, the only legitimate action would appear to be to the removal of the AccuBasic language and interpreter. This would essentially involve redesigning the entire Diebold system. This article was published in the Peninsula Daily News on March 28, 2006. With the advent of the Help America Vote Act in 2002, all polling locations across the nation are required to provide a method for disabled people to vote without assistance from another person. That keeps the voter's balloting confidential. A Port Ludlow woman has invented a low-tech system that helps the disabled vote -- solo. Computerized voting machines didn't seem to be the answer to 15-year Port Ludlow resident Ellen Theisen, because they malfunction. She began to worry about the democratic voting process. With 22 years experience as a technical writer of computer software, Theisen knew the limitations of computers and what their pitfalls are. "What got my interest was when I found out democracy was dependent on the correct alignment of ones and zeros,'' said Theisen of the digits that provide digital data. So in summer 2005, Theisen set out to fix the problem and offer disabled voters a trustworthy and private way to cast their ballots. This article was published in The Miami Herald on March 27, 2006. It is reposted here with permission of the author. The greater threat to our nation's security comes not from Dubai and its pro-Western government, but from Venezuela, where software engineers with links to the leftist, anti-American regime of Hugo Chávez are programming electronic voting machines that will soon power U.S. elections. Congress spent two weeks overreacting to news that Dubai Ports World would operate several American ports, including Miami's, but a better target for their hysteria would be the acquisition by Smartmatic International of California-based Sequoia Voting Systems, whose machines serve millions of U.S. voters. That Smartmatic -- which has been accused by Venezuela's opposition of helping Chávez rig elections in his favor -- now controls a major U.S. e-voting firm should give pause to anybody who thinks that replacing our antiquated butterfly ballots and hanging chads will restore Americans' faith in our electoral process. Consider the lack of confidence Venezuelans have in their voting system. Anti-Chávez groups have such little faith in Smartmatic's machines that they refuse to run candidates in elections anymore as reports surface of fraud and irregularities from Chávez's 2004 victory in a recall referendum. Yet somehow Smartmatic International and its Venezuelan owners were able to purchase Sequoia last year without the deal receiving any scrutiny from federal regulators -- including the Treasury Department's Committee on Foreign Investments in the United States (CFIUS), which is tasked with determining whether foreign takeovers pose security risks. CFIUS generally investigates such transactions only when the parties voluntarily submit themselves to review -- which Smartmatic did not do. But it retains the authority to initiate an investigation when it suspects a takeover compromises national security. Smartmatic has a brief but controversial history. The company was started in Caracas during the late 1990s by engineers Antonio Mugica and Alfredo Anzola. They worked out of downtown Caracas providing small-scale technology services to Latin American banks. Despite having no election experience, the tiny company rocketed from obscurity in 2004 after it was awarded a $100 million contract by the Chávez-dominated National Electoral Council to replace Venezuela's electronic voting machines for the recall vote. This article was posted on The Brad Blog. It is reposted here with permission. Summit County has recently had problems with failed memory cards as related by BRAD BLOG on March 9 and March 10. The problems in Summit County concerned a 30% failure rate found in pre-election testing for those cards. That problem alerted folks in North Carolina to test those same cards on their own ES&S machines where they discovered last week that more than 1000 of them failed to work! Now that those problems have been in the media (Yes, even the MSM has reported the problems) the vendor has decided to not be cooperative with Summit County, OH. The ES&S on-site project manager was not allowed by the company to attend a board of elections meeting to explain why there were problems with memory cards. Board members have also complained that ES&S staffers installing the system have suddenly become cold and getting any information is "like pulling teeth". This exclusive article was published on The Brad Blog. It is reposted with permission of the author. You've heard the reports of the new Diebold touch-screen voting machines which have recently been updated to include a so-called "voter-verified paper trail." You may also have heard how the printers they've added to produce these "paper trails" on their previously-paperless touch-screen voting machines are reported to jam up in test after test -- like the one last summer in California [PDF] where some 33% of such machines failed due to screen freezes, software failures and paper jams. You may have heard that Diebold actually includes a magnifying glass with each machine to help voters see these tiny, virtually unreadable "paper trails." 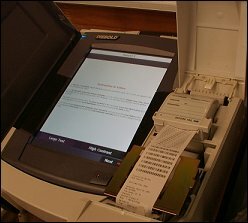 You may even have heard how the virtually uncountable thermal paper rolls, which scroll back into the machine after supposedly being "verified" by the voter, have turned up blank on some of the busiest machines at the end of Election Day -- as occurred in Lucas County, OH during the November 2005 Election in Toledo. Now, for the first time, a hands-on examination of actual Diebold Accu-Vote TSx "election-ready" machines in Utah -- where the newly state-approved and purchased machines are just now being delivered across the state -- has been conducted by Security Innovations computer security expert Harri Hursti. The examination was done in Emory County, UT with the approval of the county's elected official in charge of elections, Clerk-Recorder Bruce Funk. 1000 Cards Fail Tests in North Carolina After Massive Failures Discovered in Ohio! ALSO: Testing Reports Say Voting Machines One-Third as Reliable as Incandescent Light Bulb! This article appeared on Brad Blog. It is reposted here with permission of Brad Blog. As reported on March 9 and March 10 by The BRAD BLOG the folks in Summit Co. OH have discovered massive problems with memory cards on ES&S Electronic Voting Machines in recent tests. Some 30% of the cards completely failed. ES&S, the largest voting machine provider in the country, attributed the problem to low or dead batteries on the PCMCIA memory cards. At the time, we inquired as to whether other states using ES&S equipment might be expierencing similar problems. The reporter covering the story for the Akron Beacon Journal told us she was able to get no response from ES&S -- but was then given an assurance that ES&S had contacted their customers to inform them about the concerns. A week ago Tuesday, Texas experienced loads of problems (or "glitches" as Voting Machine Vendors and Election Officials enjoy minimizing them as) in their Primary Elections. Just a few of those reported in newspapers the day after are listed here. Then yesterday the Akron Beacon Journal reported that, in fact, ES&S had contacted North Carolina. North Carolina, who lost some 4,500 votes completely via an electronic voting machine in Cartaret County during the 2004 Presidential Election, began checking their ES&S memory cards and have so far found more than 1,000 cards that to be bad! 100,000+ Votes Were Errantly Added by Hart Machines in a Single County in Last Tuesday's Primary via Flawed, Paperless 'eSlate' Touch-Screen System! This exclusive article was posted on The Brad Blog. It is reposted here with permission of the author. Continuing in an exclusive BRAD BLOG series of Voting Machine Vendor and Election Fraud whistleblowers, another insider, from yet another voting machine company, has now come forward to reveal a myriad of known problems inside both the company and in several states and counties with whom they do business. During last Tuesday's Primary Election in the state of Texas, scores of "computer glitches" -- as voting officials and electronic voting machine vendors like to refer to them -- were revealed occurred across the state. Many of those "glitches" occurred on electronic voting equipment manufactured and supplied to various counties in Texas by the Hart InterCivic company. One such "glitch" occurred in Texas' Tarrant County, which encompasses Fort Worth. That "glitch" resulted in some 100,000 votes being added to the result totals across the county's paperless Hart-Intercivic "eSlate" touch-screen voting system. Election Officials in Tarrant claim they didn't look into the problems on Election Night as the problem emerged because, as reported by the Star-Telegram last week, "they were dealing with a new system, new procedures and some new equipment." The BRAD BLOG can now report, however, that according to a Hart InterCivic company whistleblower -- who also happened to have later worked as an "election programmer" in Tarrant County -- the problems with Hart InterCivic's systems in Tarrant County, Texas and elsewhere are not new at all. Not by a longhorn long shot. Why do Diebold's Touch-Screen Voting Machines Have Built-In Wireless Infrared Data Transfer Ports?